Blogging is fun and all, but I am not a blogger by nature...I think I am a writer in general. Other must think so too. Some have even been so nice as to publish my writing (and even pay me for it!). See links below to read some of, but not all, of the things I have had published. Admittedly this particular article is for a much smaller, niche audience then most of my writings. However, if you advise a radio or television station at the high school or college level, this article is very useful (and important) in making sure you and your program won't be fined. Want to get away without the kids but feel guilty ditching them for a parent's only vacation? We did...and then we totally didn't. Read all about it here. Did you know that Chicago is home to more than 75 neighborhoods? This article gives you some of the lesser-known family friendly spots to visit this summer. (circulation: 85,000). Have you kids asked you about comic books but you have no idea how to get started or where to go? This article should help (circulation: 85,000). This article started off looking at some unique Hall of Fame locations around the Midwest families could traverse to this summer. It pretty much maintained that theme...for the most part. (circulation: 85,000). The largest children's theater, First Stage, is just to the north of Chicago in Milwaukee, Wisconsin. Plus I've got your inside tip on where to grab a bite to eat if you are a fan of pizza. (circulation: 85,000). After dealing with some school separation anxiety issues at home last year, I decided to share our solutions. And the fine people of Family Fun were nice enough to print it for me. Side note: This is easily the biggest audience any one of my pieces has ever reached. (circulation: 2,200,000). Chicago is full of world-class museums (more than 30 in fact), but there are several that focus on the Windy City itself. (circulation: 85,000). No one wants to ever say goodbye to summer, and with my suggestions in this article you can hang onto that summer feeling a couple more times during the Fall in Chicago. (circulation: 85,000). Taking the family to the movies can be expensive, but it doesn't have to be (alright, some times it has to be). This piece looks at some unique movie houses in Chicago and the burbs. (circulation: 85,000). Looking to spend a night among the stars but not looking to travel too far from home? This piece gives you the four of the best options that just happen to be right in our area. (circulation: 85,000). It's a sport I've been playing since I was in kindergarten, so when they asked if I would like to write about Chicago's two professional teams, I jumped at the chance. (circulation: 85,000). I pitched this story about Two Rivers, Wisconsin and I almost immediately regretted it - not because it is a bad place to go, but rather because I kind of wanted to keep this awesome place to myself. (circulation: 85,000). The Chicago Blackhawks are the hottest ticket in town, but taking your entire family to a game could cost you a small fortune. This piece looks at some nearby minor league teams where the family could enjoy a game and not break the bank. (circulation: 85,000). Looking for a quick weekend getaway from Chicago that the family will love? I've got you covered in this article that tells you how and where see all the sites that relate to John Deere in both Illinois and Iowa. (circulation: 85,000). With winter fast approaching, planning a family vacation by car or plane can be tricky, but in this article I look at the alternative means of travel - riding the rails. Oh, and the kids love it too! (circulation: 85,000). Everyone knows that in a city like Chicago you can find children's theaters, but few know that the Lyric Opera, Chicago Symphony Orchestra and DePaul University have shows that cater to kids and their families. Well now you know (circulation: 85,000). A story that is more than a year in the making, last summer I was able to obtain press passes for Milwaukee's Summerfest. So we packed up the family, headed to Milwaukee and checked it out. See my review of it in the article above. Spoiler alert: Do you really think I wouldn't enjoy live music? (circulation: 100,000). Somewhat therapeutic in nature, this was written on a whim to sort of help me remember everything that we had done (both right and wrong) while bringning up our twin boys thus far. After I was done I wondered if anyone would be interested in sharing my tips for me. Chicago Parent magazine was and published the piece in print and online (circulation 150,000). Places Where Kids and Pets Can Play, Chicago Parent, March 27, 2012. I had written two opinion/essay pieces for Chicago Parent before, but this marks my first venture into the "reporting/feature" section of the magazine. As a bonus for me, the nice people of PetSmart tweeted the link to the story (circulation: 150,000). A friend of mine from college is the editor at this weekly community paper and asked if I would write a guest column for him. I happily agreed (circulation: 2,034). A Day Outside the Improv, Chicago Parent, May 23, 2008. 8th Grade Basketball, EFSLSports.com, January 2005. As the weekly columnist for this now defunct website, I was able to write pretty much about anything I wanted (you know, as long as it was clean and about sports). Foaming at the mouth for a brewery tour? Wisconsin beckons, Chicago Tribune, Sunday, May 23, 2004. Honked Off By Illinois Drivers? He's Sorry, Milwaukee Journal-Sentinel, Sunday, June 14, 2003. This was my first published piece, and it was an editorial in the Sunday edition of a decent size newspaper (circulation: 434,668). 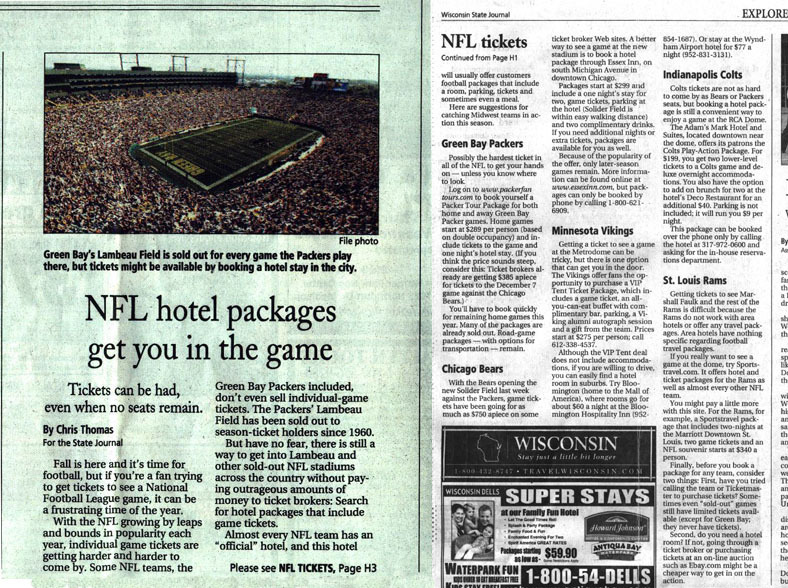 Here's How to Score Those Elusive NFL Tickets, Chicago Tribune, Sunday, October 12, 2003. Seat belt Scofflaws Sometimes Wear Uniform and Badge, Chicago Tribune, Sunday, December 28, 2003. As the Public Relations Director for this wonderful non-profit organization that serves more than 2,000 people with disabilities in DuPage County, I was asked to design and write the stories for the 2001 Annual Report. All these years later, I am still proud of our work in this document.